Hi, I recently found out there were experiments on a gas lens but the tech then disappeared.. I recently got a creepy phone call from physicist saying it had military applications but did not work properly , it never got time to be fine tuned it just disappeared.. The physics is all wonky. 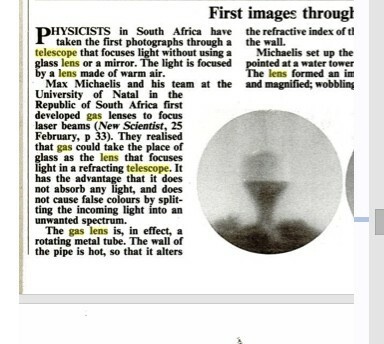 The article says that the differential refractive index of the hot gas acts as a lens to focus light. First of all light or any electromagnetic radiation cannot pass through a metal tube. Secondly no focusing is possible if the tube is of uniform diameter. I am afraid that this is a scam or the article is not giving the correct information. It cannot work as specified in the post. I have located an article in ‘nature’, which describes a different kind of gas lens. Unfortunately I cannot get the full article. There’s no mention of rotating heated tubes or such. I shall try to get the article through a library and revert if there appears to be a way forward. Why a tube? Why not a paddle? If the gas is in a (cylindrical?) container and the spinning heated tube is central to the container, it may act like a magnetic stirrer in a beaker and create a vortex. Unless there is a gradient of refractive index across the diameter of the container, how is focusing achieved? I apologise. Some further study shows that a heated tube spinning on its axis with a cold gas admitted into it can act like a positive lens with an aperture the diameter of the tube. How well this can be adapted to celestial imaging has to be seen. What if you mount long bar magnets parallel to the axis and drive with a rotating magnetic field? You can perhaps think of air bearings on the ends to avoid vibrations. Since it is essentially just the tube weight this maybe feasible. Alternatively, you can perhaps adopt a regular motor design with a hollow shaft which houses your tube. The catch is heating the tube. If nichrome tubes are available, it should be possible to get controlled heating using rotary brush contacts at the ends. Various types of hollow shaft pan cake motors are available in the market. Thanks for the SA paper. I had only seen the abstract in my earlier search. I had a cursory look. Whatever CFD I was involved in was for flow of blood through artificial heart valves. I have to pass on the SPGL bit. What size tube you are considering? 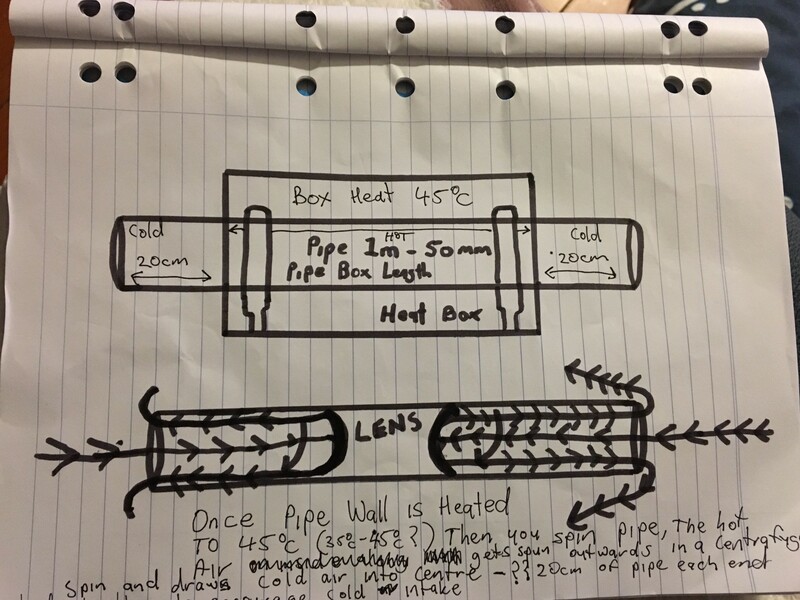 In first picture of stationary heated pipe you get some sort of multidimensional hologram, second picture i spin the tube by hand and anomaly starts forming into disc lens shape????? Sorry, but unable to view the pictures. One can look at a version of air powered Pelton wheel drive with the shaft as a 100 mm hollow shaft.